The language access services provided at Akron Children’s can be a life-saver when it comes to treating patients — literally, in some cases. Language Access Coordinator Roula Braidy remembers a refugee family who spent months traveling in and out of emergency rooms, but because interpretive services weren’t available, they couldn’t understand what was happening to their daughter. Worse yet, when the doctor prescribed medications, they didn’t understand how to administer them to her. It wasn’t until they came to Akron Children’s that, through the use of Braidy and her team, they grasped the severity of their daughter’s condition and got her the treatment she required. Braidy draws from her personal experience to help patient families. The English language she learned in Lebanon was vastly different than what Americans speak here. So when she moved to the U.S. from Lebanon nearly 14 years ago, she struggled to communicate and adapt to the differences in our culture and way of life. Karen Ingram (far right) and interpreter Damber Subba (left) help a mom shop for warm clothes for her little one. 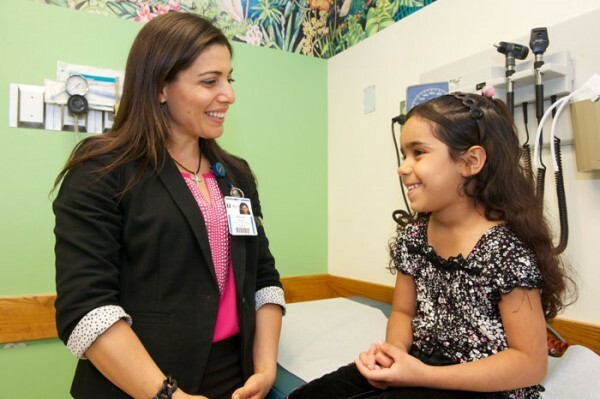 Braidy spends her days connecting her team of 8 interpreters with hospital departments who have patients with limited English proficiency, or LEP, and training them to be culturally competent. In addition to providing interpretive services, her team’s role includes easing the cultural barrier for patients and staff. The team schedules appointments for patients, coordinates transportation services, instructs them on taking and refilling their medications, and emphasizes the importance of being on time for appointments. Though face-to-face interpretation is top priority for Braidy, it’s not always possible. That’s why her team has begun integrating new tools, such as the Stratus Video Interpreting app, to ensure patients have access to interpretive services for every encounter with a provider. The service enables users to reach an interpreter via video conferencing using an iPad or other hand-held device. The app is simple to use, and its medically certified interpreters are available 24/7 and speak 175 languages as a whole. Even still, if there’s a language not covered by the app, a Pakistani language, for example, the service will connect users by phone with the necessary interpreter.